The Ginger Lees are celebrating their CD release party Wednesday, July 13 at Cafe Bella. My band, The Sweet Nothings is the opening act at 7pm. Here is the Facebook invitation. 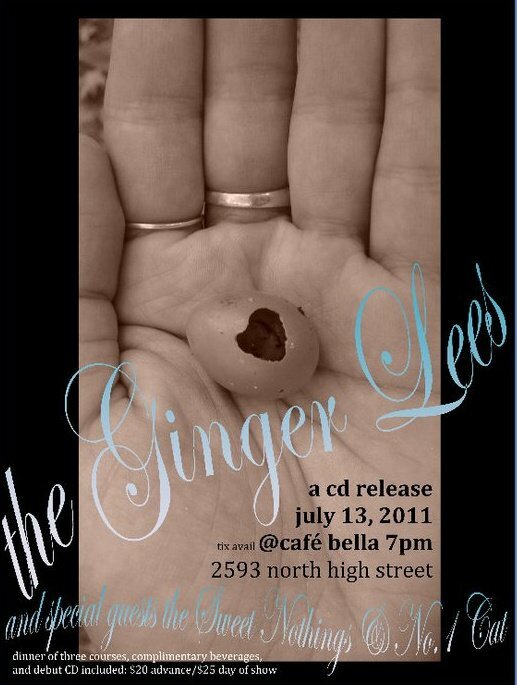 Cafe Bella is an evolving concept, restaurant and catalyst for neighborhood and community development. Untraditional in style and service, there are no set menus as food is purchased that day and dishes are created to showcase the bounty's quality and freshness. Our menu usually consists of a vegetarian dish and a chicken or fish offerring; salads, subs and pastas are also served.